ENCDC North America Successfully Concluded its Regional Congress December 1-2, 2018 in Denver Colorado. In this historic Regional Congress of ENCDC, members reaffirmed their commitment to the organization by endorsing the draft documents of the Political Charter, the Road map, and its Bylaws. For curiosity, I keep track of the number of Opposition Parties for the Liberation of Eritrea.. I have THIRTY-THREE (33).. QUESTION: Wouldn’t it better to have ONE GROUP of LIBERATION FORCE? I am, of course, ASSUMING that they are all working for the same aim. Arn’t they ???!!!. Of course they have the same aim but ” Medemer ” does make them WAKE up them? let and see. Putting the joke aside, 5 to 10% of these 33 or so are created, trained, and successfully infiltrated these organizations and they are the ones for these never end splittings. From past activities, they don’t seem to have one enemy: hgdf. Solution: these organizations priority should be to identifying their internal enemies (moles). Or, someone should lay all off and start from scratch. Never too late. I suspect some of them may have a dream of becoming the future president of Eritrea. It is ok to have the aspiration, but the aim of the struggle should be to liberate Eritrea, and its people. Once the dictatorial junta is removed, Eritrean people will elect their own president. 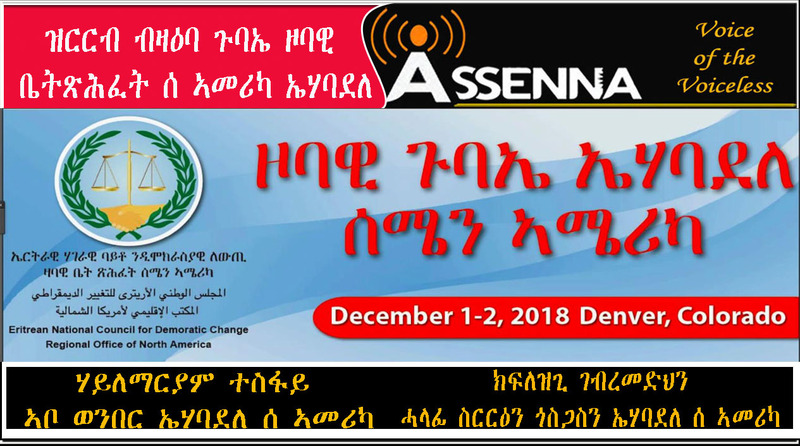 These organizations are long discredited as woyane lackeys and as such, it was they who enabled the impostor isaias afewerk to drag Eritrea and it’s people to the current abyss we are in. Whatever they say now, they cannot clean themselves of their tarnished past in which they took part in the 1998 Eritrean-Ethiopian war on the side of woyane and bled their own people. Plus, they accepted a constitution that was a carbon copy of the Ethiopia constitution, which allows any ethnic group for self determination up to cessassion. Needless to say, this constitution was a conspiracy hatched by woyane to decimate Eritrea piecemeal through multiple of referedums. You guessed it, Denkelia had been the number woyane priority on the list to part from Eritrea. The second? Of course, Kunama. Remember, woyane had recognized and supported Afar Liberation Front. Far and beyond, the so called new ELF,the core constituent of this organization ,had long renounced the the quest for independent Eritrea and accepted two autonomous states—low land and highland—under Ethiopian rule during the Derg era. The rampant woyane level of corruptions and crimes is being unearthed in Ethiopia and it seems there is no end to it. For the good of Ethiopia, I will not be thus surprized, if the people of TigraI and the rest of Ethiopia call for the total dismantling of woyane as an organization. I suggest, the same for its Eritrean lackeys. They are total liability in our struggle against the impostor isaias afewerk and his cabals. As it is, however, it is a shame that a supreme world power, the United States of America, the defender of Freedom, Liberty, Independence, Justice, Equality and Democracy Is dealing with the self-appointed ruler against the innocent people pf Eritrea. What does THAT make the USA? Definitely NOT a champion of HUMAN RIGHT. The true glaring answer is too strong to spell it out.